In the case of a compact VACOMASS® system, the thermal sensor is positioned directly upstream of the control valve. Thus the flow profile will fluctuate steadily during system operation. Without correction, this will lead to errors when measuring the air supply. In order to correct for these flow profile distortions, the setting of the control valve is indicated at any time. To solve this request the control characteristic curve of the valve and specific process data of the sewage plant are stored in each VACOMASS® master module. The VACOMASS® basic-module is an electronic module, which calculates the corrected flow signal based on actual valve position and transfers the flow signal to the SPC or PLC (automatic flow profile correction). 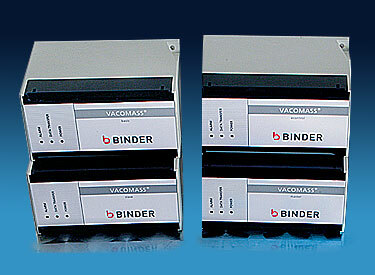 The adjustment of the valve must be done by customer´s SPC or PLC, it is not realized by VACOMASS®. 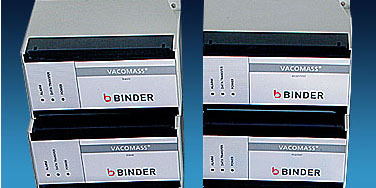 The VACOMASS® slave-module is an electronic module, which controls the local air supply by a given air flow (e.g. from PLC or other master-module). The flow signals, the flow profile correction and specific calibration data of the flow meter will be considered and used to set the control valve to a new position. The VACOMASS® master-module is an electronic module for permanent and automatic calculation of actual required air flow and new position of the control valve for local control of air supply. It realizes the adjustment of the valve too. The Customer´s PLC defines the setpoint for DO-concentration. In case of control deviations, the microprocessor based electronics calculates exactly the new setting of the control valve, thus allowing for precise adjustment in only one single control step. So switching frequency and finally wear of the gear and valve can be reduced. If flow meter signal is not reasonable, an approximate value of air flow will be calculated. Further process parameter like ammonia and/or nitrate concentration can be used and integrated in the control circuit. Any disruption, such as at the aerators and probes, can be detected immediately. Only signals from well working probes will be considered for control purpose. VACOMASS® provides comprehensive monitoring functions allowing each process disruption to be indicated immediately. Additionally, the control of the air supply can always be taken over via the process control system. Upon the occurrence of a fault, the control valve will automatically move into a safe position. In this way, VACOMASS® ensures a surplus of oxygen at any time. The complete process control and adjustment of the valves can be realized SPC-based also using VACOMASS® flexcontrol without any technical restriction as an option.